Were you able to guess the place and time of today’s photo? 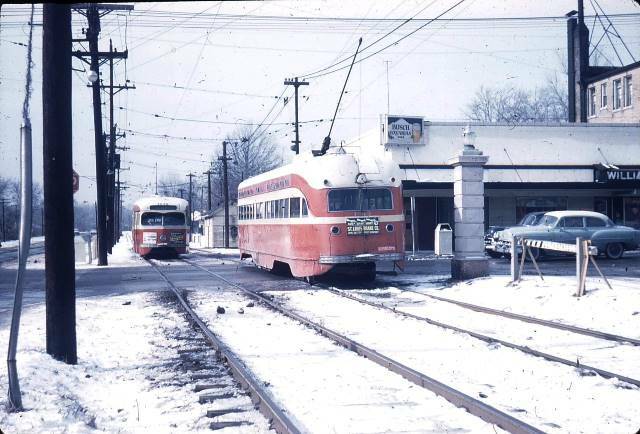 Judging by the amount of white stuff on the ground, the photo could have been taken today if not for the streetcars and 1950s autos. The key hint in today’s photo is the portion of the Williams Pharmacy sign at right. That tells us this photo is taken at the old Millbrook (now Forest Park Parway.) at Big Bend. The time is the mid-1950s. The Williams Pharmacy was a St. Louis institution from 1952 to 2011 when it closed after 59 years of service to the community. Sometime in the 1950’s. Big Bend and Milbrook?